Margaret Atwood wrote that water is patient, Martin Luther King opined for justice to roll down like water, and Leonardo da Vinci reminds us that water is the driving force in nature. Universally considered an eternal symbol of life, purity, and rebirth, water comprises 71 percent of our planet and over 50 percent of our bodies. Oh, and also, there was a time that the water literally caught on fire in Cleveland. So there’s that. The relationship between Cleveland and our local bodies of water is a complicated one, no more so than on June 22, 1969 when sparks from a passing train ignited oil-soaked detritus in the Cuyahoga River. 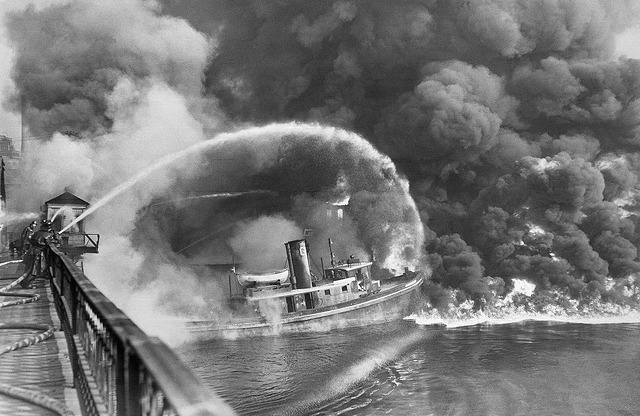 Although it was neither the first industrial fire on an American river—nor even the first time the Cuyahoga itself ignited—this incident captured the attention of a country coming to grips with environmental pollution in our nation’s waterways. That sense of urgency then sparked a string of reform efforts to preserve our water supply, even as the often-embarrassing press coverage on the fire did great harm to Cleveland’s reputation.